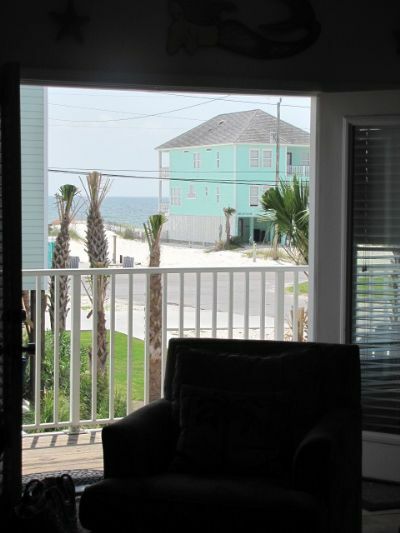 Gulf Shores Alabama Ocean House for rent by owner, Duplex with pool and splashpad. 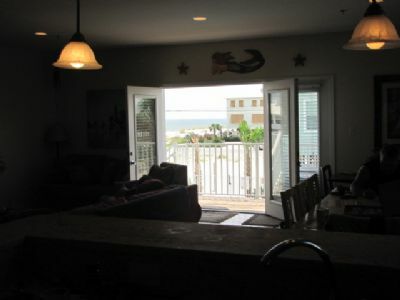 DIRECT Beach Access is 50 ft.
Gulf View from inside kitchen! Full Size Saline Pool with Gulf Views! Aerial Shot! Amazing Gulf Views! The Track...Go Carts, Mini Golf, Bumper Boats, Rides FAMILY FUN! LuLu Buffet's Restaurant and Mountain Rope Course...Crazy Fun! Let all your cares and worries driftway at.. 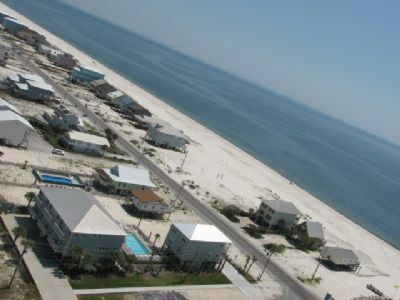 This fantastic brand new 2600 square foot 5 bedroom, 3 full bath Beach House is just steps away from the beautiful sugar sand beaches of GulfShores!! Not only are you right there at the beach, "SugarSands" is part of a private Beach House community consisting of 5 private units. A brand new full size 40'x21' underground saline pool is right on the property with ample patio areas! 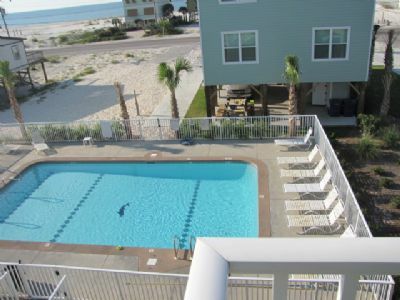 You can relax at the pool while still enjoying views of the Gulf and beach! 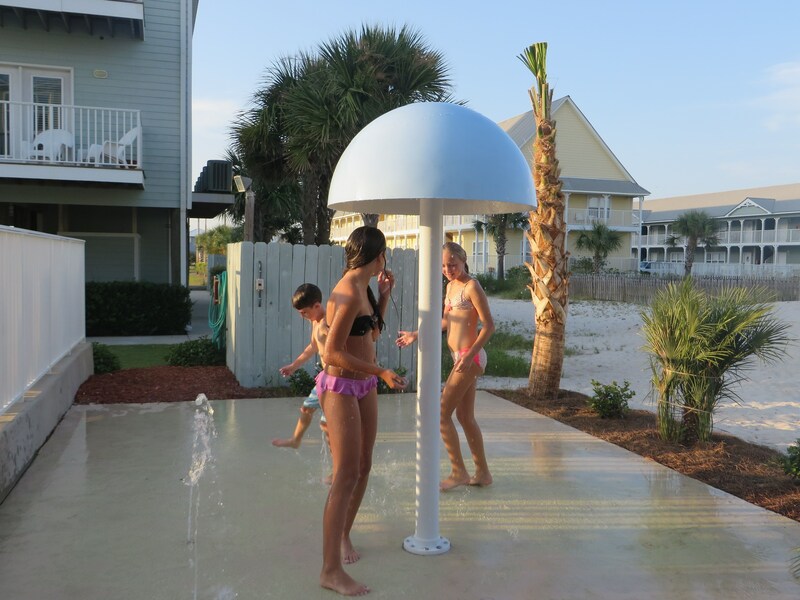 In addition to the large Saline pool, there is a “Splash Pad” for hours of entertainment for our younger guests, as well as a shuffle board court. 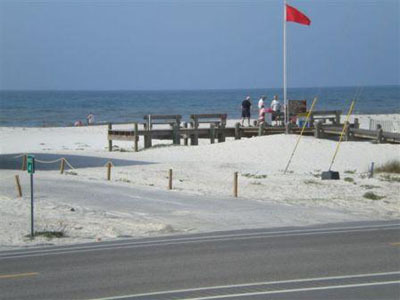 The Beach and Gulf are just steps away. 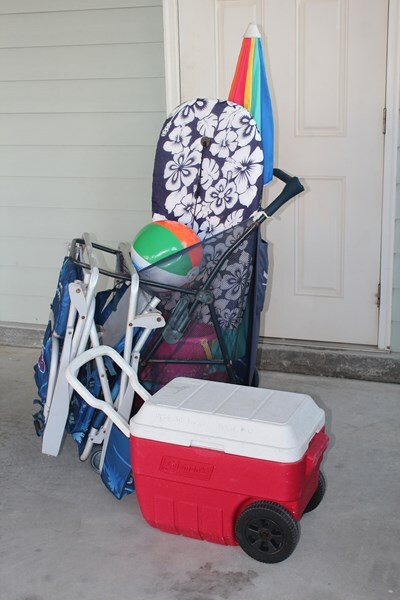 Included in the storage area is eight beach chairs, beach cooler, beach cart as well as pool and beach toys for guests use during their stay. 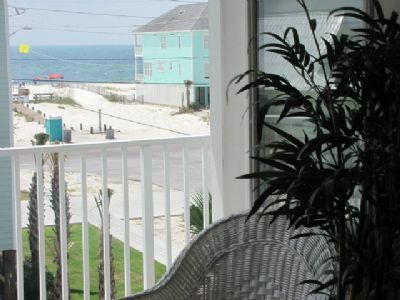 This spacious 5 bedroom, 3 full bath Gulf Shores Ocean House will feel just like home with all the luxuries and amenities it has to offer you and your family! 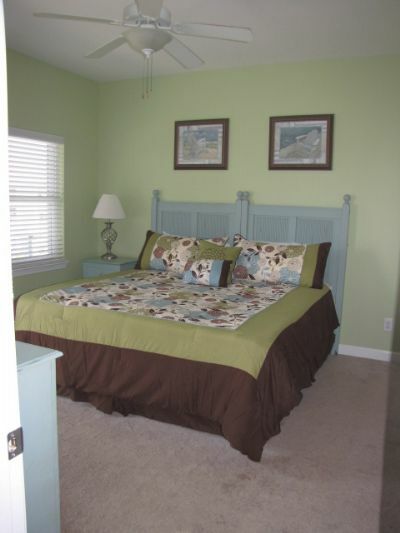 We can comfortably sleep 14-16 all bedrooms come with tv, cable and dvd player! 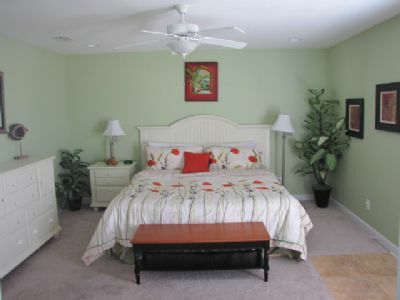 All bed linens and bathtowels are provided! Free Wi-Fi! Lagoon King Suite #2(bedroom 2) located on the main floor, features a luxurious king size bed with a Memory Foam Mattress,... comfort at its best!! 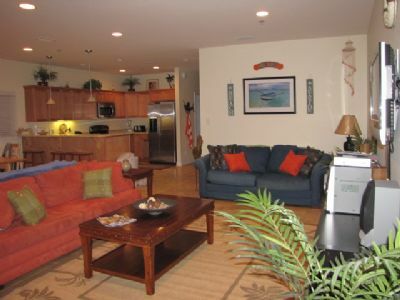 Also enjoy your own private deck with views of the Lagoon, full bath and a 15" flatscreen tv! 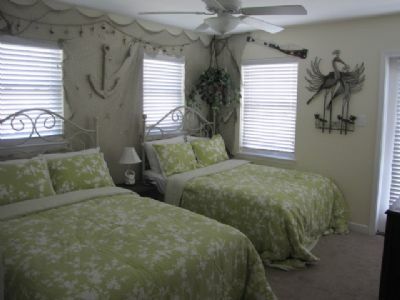 Queen Suite (bedroom 3) located upstairs, features a beautiful queen bed, large closet and deck with views of the Lagoon & Gulf! 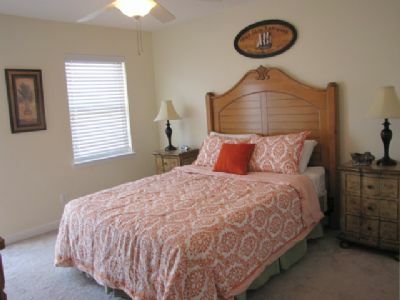 Full Size Suite (bedroom 4) located upstairs, features 2 Full Size Beds, large closet and deck with views of the Lagoon & Gulf! 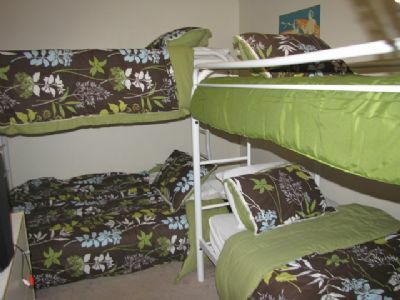 Bunk Bed Loft (bedroom 5) located upstairs features 2 sets of bunks beds! The bottom of one bunked is a full size futon converting to bed or couch! 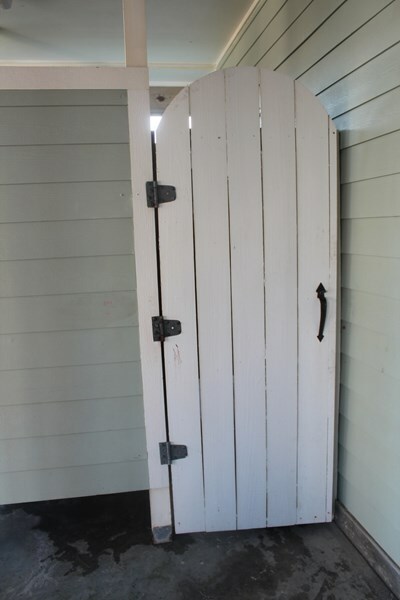 Perfect for the kids to getaway to play games and watch movies! The huge Family Room/Kitchen/Dining Area is 25 ft x 40 ft !! Offering plenty of seating and elbow room for all guests! 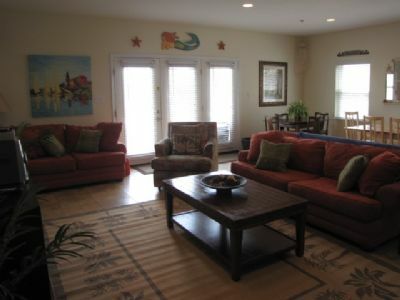 Family Room has a 32" flat screen tv, cable and dvd player! QUEEN SOFA SLEEPER! 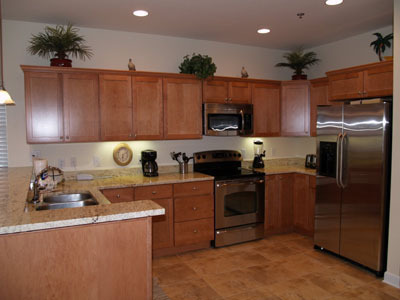 Brand New Kitchen features granite countertops and state of the art stainless steel appliances! Kitchen comes complete with everything you need...coffee maker, microwave, dishwasher, toaster, blender, griddle and all the dishes and utensils you need to make cooking a pleasure! 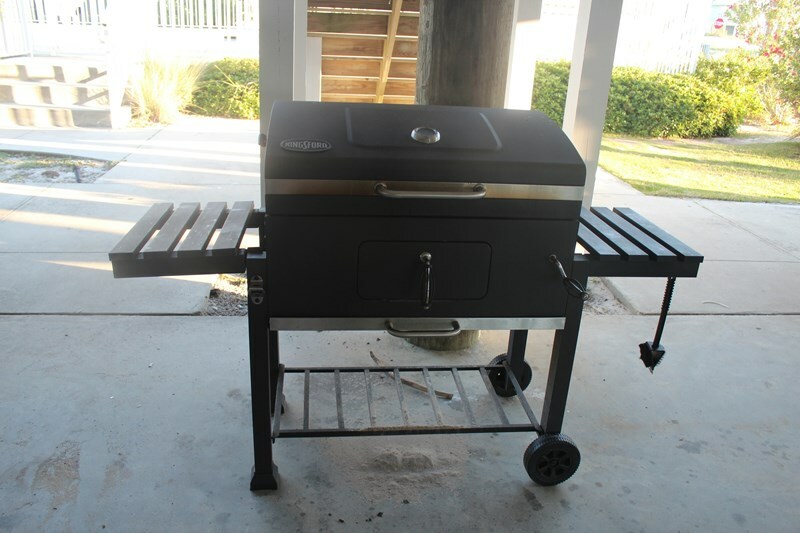 Gas grill is outside! Washer/Dryer iron and ironing board are located on main floor in laundry room. Need a crib or other baby items? 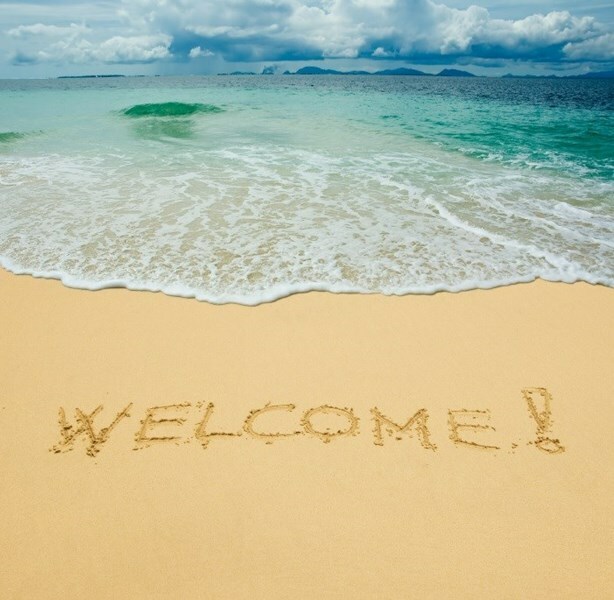 Call Baby Beach Rental (866) 955-BABY (2229) They will have crib and highchair set up for you before you arrive and come back and take it all down for you. 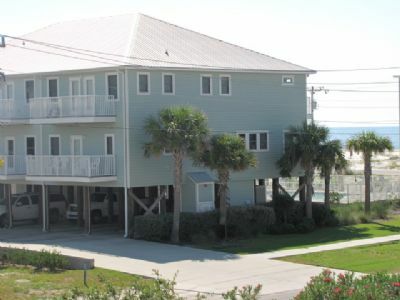 Fees are seperate and will be bill by "Baby Beach Rentals"
Located within minutes of "SugarSands" Beach House are ten golf courses including Alabama's #1 rate Kiva Dunes. 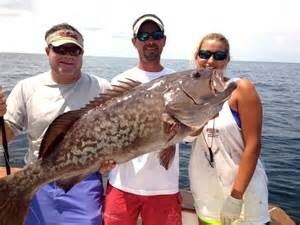 Fishing is just 2 blocks away at "The Pass" (where Gulf & Lagoon meet). 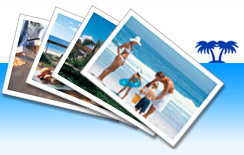 Also enjoy deep sea fishing, dolphin cruises, sunset cruises, historic FortMorgan, Outlet Shopping, fantastic dining and entertainment nearby! BBQ Grill Community Pool Outside Shower Porch Porch Furniture Private Parking Private Pool Surfing enclosed outdoor shower with hot water!! 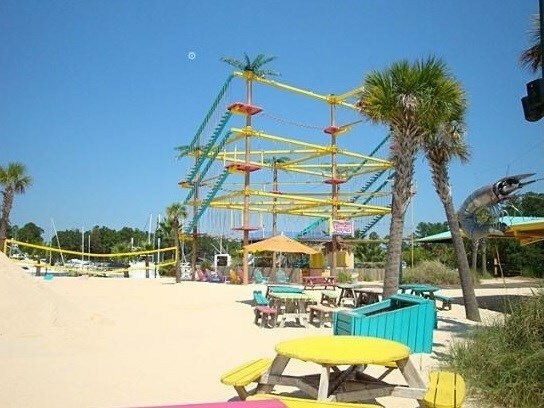 Amusement Park Antique Shops Beach Bike Rental Bird Watching Boating Bowling Camping Canoe Rental Fishing Four Wheeling Gift Shop Golf Hiking Hunting Jet Ski Kayaking Minature Golf ParaSailing Restaurants Scuba Snorkling Swimming Walking Trails Water Park Water Skiing Wildlife Viewing great outlet mall! 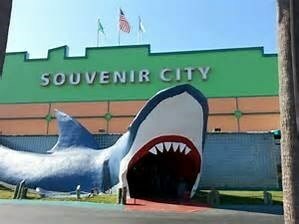 Dolphin viewing up close from boat Great go cart tracks and putt putt huge water and amusement park!